Snow in Protection, Comanche County, Kansas, 31 Jan 2005. Photo by Orlin Loucks. Comanche Pool Area Bird & Nature Tour, 21 May 2005. The Eagle 1955: The Coldwater School Yearbook, 1955. Courtesy of Buddy M. Bardot. photos courtesy of Teresa Chapman & Phyllis Scherich. Images of all 32 pages of the year book: Wilmore students, Seniors to First Graders, Administration members and Activities, courtesy of Doug & Rhonda Nickel. Images of all 23 pages of photographs of Wilmore students, Seniors to First Graders, Board of Education, Faculty and other school staff members, courtesy of Nancy Smith. Images of all 5 pages of photographs of Wilmore students, Eighth Graders to First Graders, Faculty and other school staff members, courtesy of Nancy Smith. 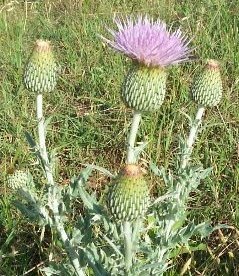 This gallery of photographs by Phyllis Scherich and Bobbi Huck pictures some of the wildflowers which grow in Comanche County, Kansas. What do wildflowers have to do with family history? Well, my dad told me of how my grand-dad would always start off early in the morning when going to the Wilmore Cemetery on Memorial Day, and that he and Grandma Nellie and their kids, if they still lived at home at the time, would stop and pick wildflowers on the way to memorial services so that they could put flowers on the graves of people who didn't have family still living in the area to decorate their graves. These photos show some of the flowers which were probably part of those bouquets. Hiram J. & Fidelia Jordan of Protection, Comanche County, Ks. Thanks to Connie Chancellor for this featured material. Wendel Ferrin's Collection of Photos, Comanche County, Ks, circa 1944. Pictured: Nina Hope Annis, Junior Baily, Grace Calloway, Donna Chance, Dorothy Cline, Evah Ellis, Delmer Ferrin, Wendel Ferrin, Robert Hackney, Ernest Lawrence, Mozetta Mangels, Professor Oxley, Viola Peaster, Aleen Ray, Marie Schenk, Norma Scholle, Forrest Smith, Wesley Smith, Roberta Todd, Melva Toothaker, Jimmy Trummel, Marie Trummel, Paul Ward, Bob White, Patsy Wood, Bobby Woods, Francis Wright, Ernestine Zeigler. "In 1917 Mr. Murray opened a studio in Coldwater and continued the business 23 years, or until 1940, when his health forced him to retire to the farm. For a number of years he had been in failing health, due to poisoning from photographic chemicals." Surnames: Deewall, Gard, Hackney, Hagan, Harbaugh, Harness, Knecht & Taylor. The Buttermilk, Kansas, Softball Team, circa 1950. Photo from the collection of Delmar Huck. Surnames: Blount, Guizlo, Haas, Huck, Lohrding, Oller, Richardson & Wilson. A photograph of the 18 men from the Wilmore Methodist & Christian churches with some of the 8 hogs they'd slaughtered for the community's annual Methodist - Christian Brotherhood groundhog supper to which the entire community was invited. Pictured circa 1954 are: Ed Baker, Lew Baker, Rod Baker, Marvin Belcher, Jack Bond, Gene Dorsey, Ernest Ferrin, Wendel Ferrin, Bob Hackney, Louis Helm, George Kennedy, Charley Lenertz, Rev. Wayne Riggs, Homer Ring, Fay Smith, Melvin Smith, Leo Thornberry and Ord Trummel. Photos: Christa Ashlock, Marjorie Brewer, Beverly Hoosier, Marcelline Hughes, Josephine Jantzen, Marjorie Lindsey, Bobby McFarland, Alice Lorene Norton, Donald Norton, Wanda Norton, William Robert Norton, Ruby Schultz, Anna Faye Tetrick, Dorothy Thomas, Roxie Young. Robert C. Graham, Sponsor; Wayne Woolfolk, Treasurer; George L. Cushman, Superintendent; Claude Junior Prilliman, President; T.M. Johnson, Sponsor; A. Junior Pfieffer, Vice-President; Dorothy Thomas, Secretary; Lewis Murphy; Wayne Webb; Vernon Webb, Reporter; Helen Louise Harvey; Ernest L. Rhodes; Alice Norton; Dennis Atkeson; Majorie Brewer; Sylvester Breit; Leslie E. Jellison; Majorie Lindsey; Robert Zane; Ruby Schultz; Donald Morlan. Cowboy Cemetery near Salt Plains, Woods County, Oklahoma. Photos and information courtesy of Bobbi (Hackney) Huck. Photographs from the Collection of J.M. & Minerva Cline, printed from the original glass plate negatives by Russell Fay Cline. People's State Bank, Coldwater, Kansas, three historic photo postcards courtesy of Hiram Lewis. Hell's Half Acre - Comanche County, Kansas. 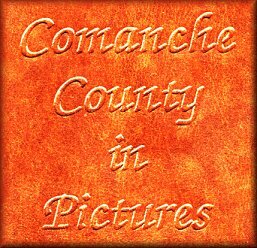 Comanche County in Pictures was printed in 1988 by the Taylor Publishing Company, Dallas, Texas. The County Coordinator was Lisa Brooks and the Publishing Consultant was Denise Reidel. This RootsWeb website is being created by Jerry Ferrin with the able assistance of many Contributors. Your comments, suggestions and contributions of historical information and photographs to this site are welcome. Please sign the Guest Book. This page was last updated 10 Jan 2005. The following RootsWeb Visitors Counter began counting on 6 July 2008.